Helena is a creative artist, illustrator and art instructor. She grew up in Kiev, absorbing into her art the majestic Ukrainian colours. After getting her Bachelor’s degree in Fine Arts and Art Education, Helena worked as an art director for two diamond industry magazines. In the past 19 years, Helena creates her paintings and collaborates with authors designing and illustrating their books. She exhibits her oil paintings and pastel drawings at art galleries and events. 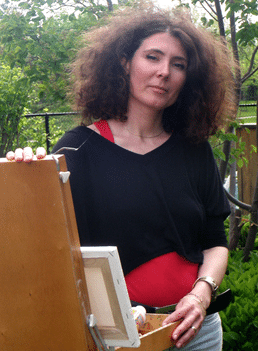 Helena has travelled all over Canada to give workshops and demos. Helena specializes in expressive life drawing and painting. She is one of the Portfolio Expert Team members at AOMA.